A memory surfaces, now and then, which makes my brain freeze. It’s the late 1990s. We’re staying with a farmer outside Lusaka, Zambia’s capital city. He’s very hospitable, bought us new, blue mats to step onto when we get out of bed. But they’re lethal, slipping out from under our feet, so we avoid them, keep to the cold, polished concrete floor. At night the corner of the tin roof above our room flaps in the wind and bangs, keeping me awake. But I don’t mind. Because that’s my escape route. I’d be awake even without the clanging roof. Because we’re locked in at night. Not locked in like you are at night – you know, front door locked, back door locked, downstairs windows shut. For one thing there’s only downstairs, no upstairs. For another thing we don’t need to shut the windows – wouldn’t if it weren’t for the mosquitoes – because there are thick iron bars on them all. At night our host pulls shut and locks a heavy metal door, like a huge safe door, blocking the corridor and confining us all in two rooms leading off it. He, his wife, son and daughter have one bedroom, we the other. No chance of climbing out of the barred window. So my escape route – in the event that fire breaks out and we can’t open the door – is the flapping roof. You think fire’s unlikely? Well, given the erratic electricity, given the candles – it’s possible. And not just because of an accident. 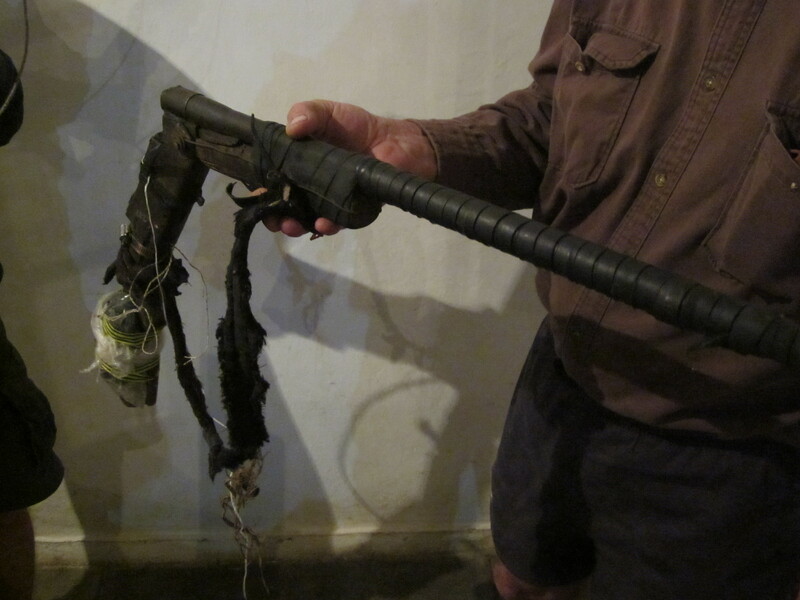 A burning rag, a home-made petrol bomb … I know, I have too much imagination. But it’s one of the sad things about urban Zambia – though it’s probably less of a problem than in some other African countries I’ve visited – that crime is a fact of daily life. Burglary, in particular. Criminals are often desperate. Home-made firearms are not uncommon, nor are axes and knives. Anyone who has anything in the big city – like a home with a television – builds a fence, a wall, a gate. Tops them with broken glass, or razor wire. Hires a night watchman. Keeps dogs. But these things can be circumvented – and sometimes the tool is a human being. A trusted servant, for example, who, for some reason, turns on the employer. We’re well outside the city, but there have been attacks in the area around us. A terrible murder on a nearby farm. The victims were close to our host. Could not have been closer. One was a parent. And it was Christmas. The atmosphere’s tense at night. The woman of the house and her daughter, we suspect, don’t often stay here now. The little girl was there, at Christmas, when the bodies were found. 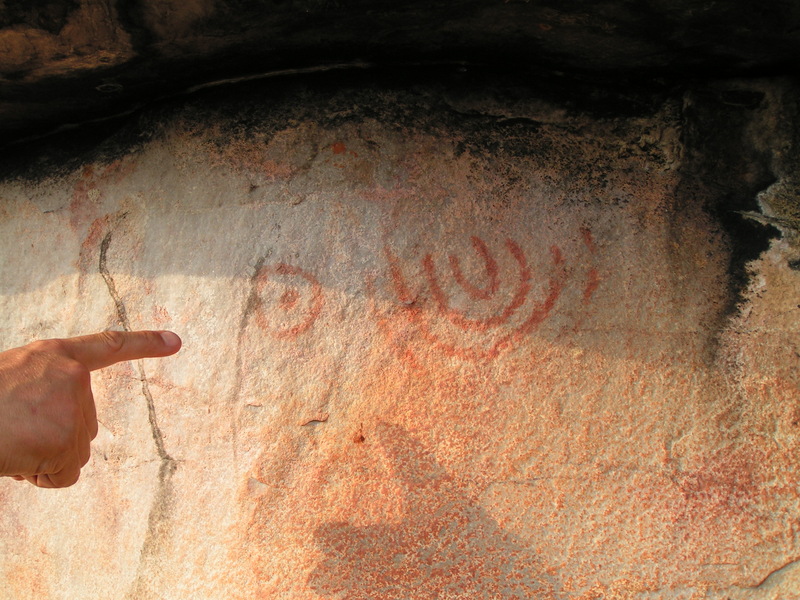 One day our farmer offers to take us to see some rock art, newly discovered by a schoolgirl. It’s a long drive so we stay overnight at his nephew’s house. Our bedroom walls are covered with the flattest spiders I’ve ever seen, like starfish. I pretend they’re wallpaper. They don’t seem to move a lot. We pick up our teenaged guide and park by a reservoir used by middle class Zambians and ex-pats for water sports. Have a soft drink at the anglers’ club house, use the loo. Then start the climb into the hills, seeking a small rock shelter. It’s warm, becoming warmer by the minute. Winter in Zambia’s tolerably hot by day and here, on the high plateau, cold at night. The slopes are dotted with boulders and rocks and stones. Leaves rusty from age and desiccation. Blackened twigs and – everywhere – the dust, the orange dust. I’m not a great climber. And our guide’s a sporty teenage girl. It’s hard to keep up. It becomes clear I’d have to do some serious climbing to reach the rock shelter, so I opt to stay behind. Wait to hear if it’s worth it. I stand on a boulder. It’s dark, grey and pretty large. Basking, inanimate, in the sun. I can hear the others – it’s not far, just an awkward climb – chattering. About one of my steps away from me is a hole in the basking rock. I don’t want to, but I can’t stop myself. I look into that hole. The black mamba’s a sinister-looking snake. If you wanted a model for the serpent in the Garden of Eden I’d look no further. Not black, that would be too obvious, but grey. A sleek, grey, lethal shadow. I can see its eyes, its coffin-shaped head. And do I run? No. I do nothing. I stand, on a rock, in the sun, staring at a black mamba. When I first came to Zambia I read a book about snakes. I thought confronting my fears, learning about them, would help. It didn’t. The black mamba’s bite can kill in fifteen minutes. It will attack if you’re between it and its goal – its hole in a rock, for example. It rears up and lunges. Bites. Kills. I suppose my reasoning is that it’s already home, in its hole. It won’t attack. So I keep on standing. And staring. The others return. Archaeo-man pulls me away and we run downhill, fast as we can. In the 4×4 on our way back, we’re driving past a small village when I see a strange figure with bright red hair. No one else sees it. I describe what I thought was a woman. It was a shaman. And I remember thinking as we drove on, through a patch of burning grassland, with scorching flames crackling and roaring either side of us, that I’d be glad to get back to the farm. You don’t always know when you’ve got it good, do you? 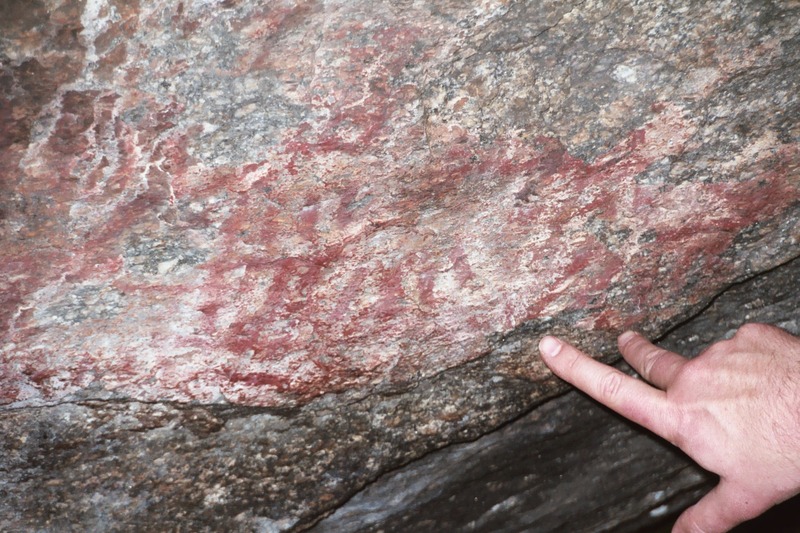 This entry was posted in Travelling, Zambia and tagged black mamba, burglary, bushfire, crime, farmer, home made firearms, Lusaka, murder, rock art, shaman, spiders. Bookmark the permalink. 8 Responses to Mad? Lucky? Or just plain stupid, with a death-wish? That story caught me from beginning to end! So much adrenaline you made me spend!! Sorry! Hope you enjoyed it though after all that! If I wasn’t aware of your background, I say this is surreal, what a story. And for all the terrors, I’m sure Zambia is a wonderful, fascinating place, that to visit you’d have to set aside usual notions of normal so you would be able to function. I think I’m reasonably stoic but all those scenarios would indeed put it to the test. Particularly internal mental sabotage from being locked in vs actual external threat. Those fears that we conjure up seem more powerful than actual encounters, until our thought processes catch up to reality… and we realise how tangible risk is from a near miss perspective. Excellent storytelling, I felt like I was there with you looking into that hole. I hate snakes but probably not as much as spiders…..